AUTHOR DERRICK FERGUSON JOINS PRO SE SINGLE SHOT SIGNATURE LINE WITH ‘TALES OF FORTUNE’! Pro Se Productions proudly announces the debut of yet another stellar Pro Se Single Shot Signature Series. From the waterways of Sovereign City and the explosive imagination of author Derrick Ferguson comes a series of digital singles featuring characters from Ferguson's The Adventures of Fortune McCall! Tales of Fortune is a recurring series of stand alone tales that will spotlight the team of friends that work side by side with Fortune McCall in his sanctioned crusade to save Sovereign City from its criminal element. From the decks of McCall's floating casino, The Heart of Fortune, to the darkest parts of Sovereign itself, the men and women who support McCall in his fight against evil now shine on their own in Tales of Fortune! The debut story in this series, For Violent Fires that Soon Burn Out, focuses on Tracy Scott, McCall's cousin and probably the second most dangerous person on the Heart of Fortune. When McCall is asked by the head of a local organization to look into possible arsons of tenement buildings in the worst part of Sovereign, Fortune gives the duty to Tracy. With her own prejudices as well very negative feelings about playing detective, Tracy takes to the streets of the city to learn who is striking out at Sovereign's poor and helpless. As brick and steel burn around her, Tracy finds herself confronting corruption, deceit, and a madness most heated. 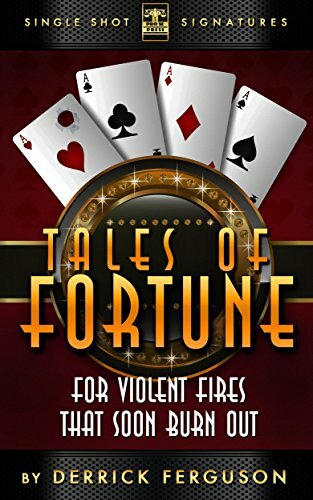 For Violent Fires that Soon Burn Out, the first digital single in Derrick Ferguson's Pro Se Single Shot Signature Series- The Tales of Fortune, sports a fantastic cover and logo design by Jeff Hayes and digital formatting by Russ Anderson. The debut short story of the series is available for only 99 cents for the Kindle via Amazon at http://tinyurl.com/l24zmjw and for most digital formats at http://tinyurl.com/n6q5hct.